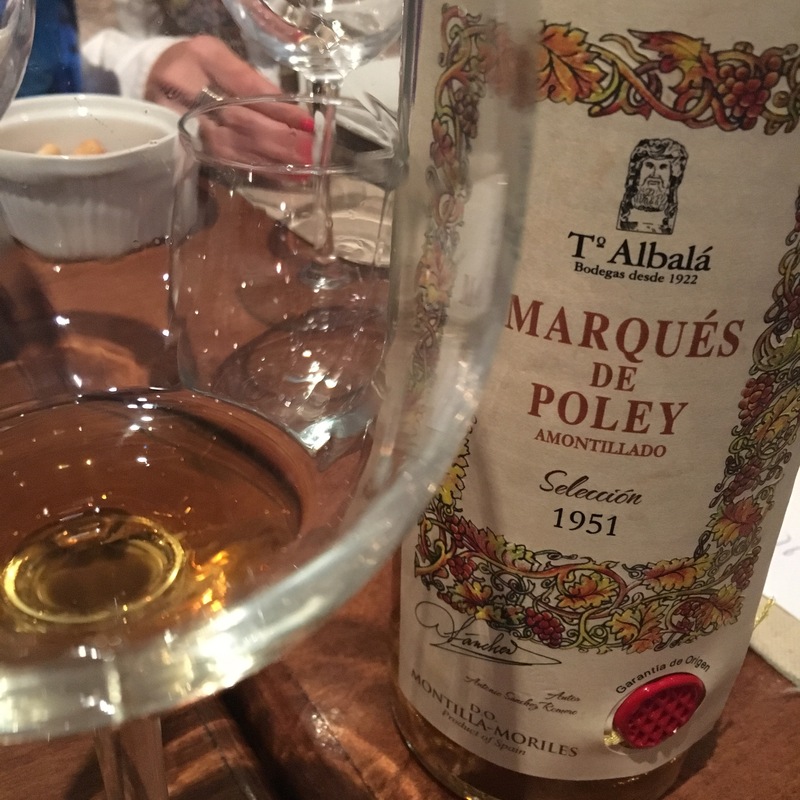 A fantastic night at Taberna Palo Cortado started with this 1951 Marques de Poley Amontillado. All of the wines were single vintage “añada” wines but not “statically” aged – the “merma” or evaporation of the wines had been replaced by wines from the same añada (and it wasn’t clear whether the wines had been “moved” between barrels in addition to that). Anyway, moved or not, this is a 65 year old dry amontillado (Montilla amontillado, as Antonio Barbadillo pointed out) that is 100 pedro ximenez but unbelievably fine and light. I have written in the past about how elegant single vintage wines seem to remain, but this one was really amazingly excellent given its age and cepage. You can’t really see the colour above because I didn’t get hold of the bottle until the glass was nearly gone, but it was crystal clear and a really lovely amber colour, extremely appetising. The nose had a spirit quality that was nearer to brandy than petrol fumes, a really fine nose of caramel and alcohol. Then on the palate it had a combination of acidity and zing, that didn’t so much burn as freshen, followed by notes of caramel then quickly tobacco and leather, before a long, long bitter almond finish.